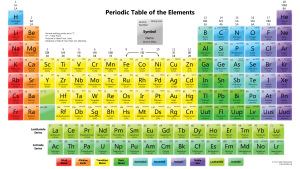 Where in the Periodic Table Will We Put Element 119? 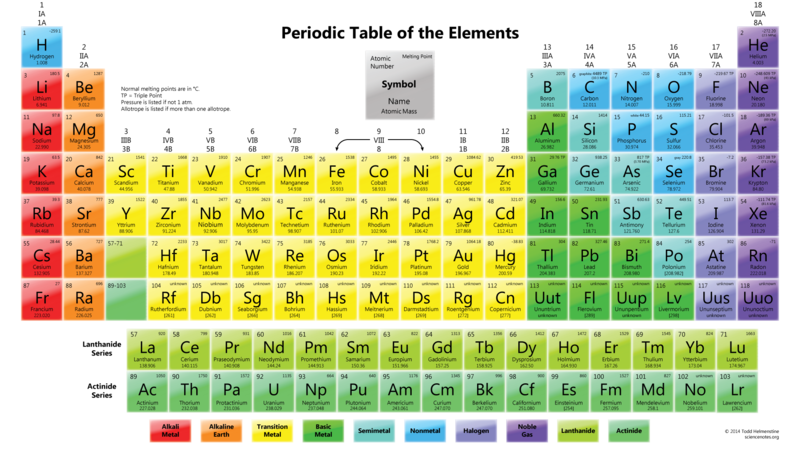 In 1869, Russian chemist Dimitri Mendeleev proposed the first modern periodic table of elements, in which he arranged the 60 known elements in order of their increasing atomic masses (average mass, considering relative abundance of isotopes in naturally-occurring elements), with elements organized into groups based their similar properties. 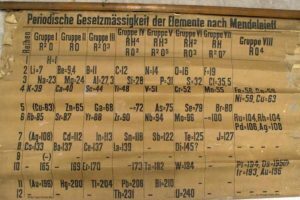 Mendeleev observed that certain properties recur at regular intervals in the periodic table, thereby defining the groupings of elements. 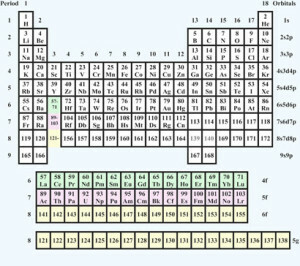 This first version of the periodic table is compared to the modern periodic table in the following diagram prepared by SIPSAWIYA.COM. Mendeleev’s periodic table consisted of Groups I to VIII in the modern periodic table. German chemist Lothar Meyer was competing with Mendeleev to publish the first periodic table. 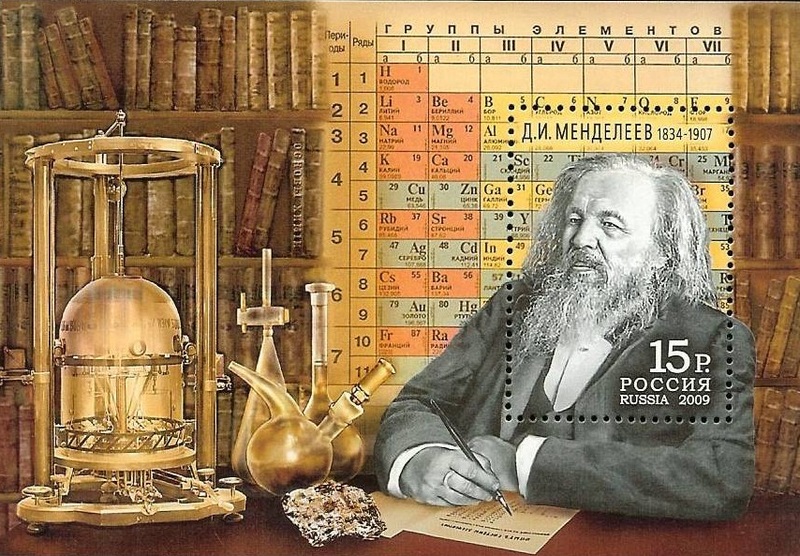 The general consensus is that Mendeleev, not Meyer, was the true inventor of the periodic table because of the accuracy and detail of Mendeleev’s work. 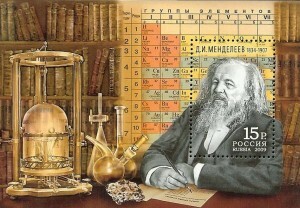 Element mendelevium (101) was named in honor of Dimitri Mendeleev. The modern periodic table organizes elements according to their atomic numbers (number of protons in the nucleus) into 7 periods (vertical) and 18 groups (horizontal). The version shown below, in the International Union of Pure and Applied Chemistry (IUPAC) format, accounts for elements up to atomic number 118 and color-codes 10 different chemical series. In 1944, Seaborg formulated the ‘actinide concept’ of heavy element electron structure, which predicted that the actinides, including the first 11 transuranium elements, would form a transition series analogous to the rare earth series of lanthanide elements. The actinide concept showed how the transuranium elements fit into the periodic table. Between 1944 and 1958, Seaborg identified eight transuranium elements: americium (95), curium (96), berkelium (97), californium (98), einsteinium (99), fermium (100), mendelevium (101), and nobelium (102). On 30 December 2015, IUPAC announced the verification of the discoveries of the following four new elements: 113, 115, 117 and 118.
Credit for the discovery of element 113 was given to a team of scientists from the Riken institute in Japan. Credit for discovery of elements 115 , 117 and 118 was given to a Russian-American team of scientists at the Joint Institute for Nuclear Research in Dubna and Lawrence Livermore National Laboratory in California. These four elements complete the 7th period of the periodic table of elements. The current table is now full. On 28 November 2016, the IUPAC approved the names and symbols for these four new elements: nihonium (Nh), moscovium (Mc), tennessine (Ts), and oganesson (Og), respectively for element 113, 115, 117, and 118. Nihonium was the first element named in Asia. The number of physically possible elements is unknown. In 1969, Glenn T. Seaborg proposed the following extended periodic table to account for undiscovered elements from atomic number 110 to 173, including the “super-actinide” series of elements (atomic numbers 121 to 155). So where will we place element 119 in the periodic table of elements? 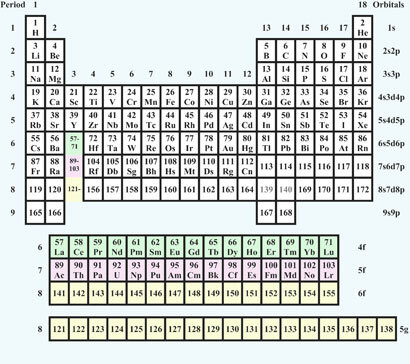 Based on both the Seaborg and Pyykkö extended periodic tables described above, element 119 will be the start of period 8 and it will be an alkali metal. Element 120 will be an alkaline earth. With element 121, we’ll enter the new chemical series of the “super-actinides”. These are exciting times for scientists attempting to discover new super-heavy elements. Where does neutronium fit in the periodic table? Neutronium is a name coined in 1926 by scientist Andreas von Antropoff for a proposed “element of atomic number zero” (i.e., because it has no protons) that he placed at the head of the periodic table. In modern usage, the extremely dense core of a neutron star is referred to as “degenerate neutronium”. Neutronium also finds many hypothetical applications in modern science fiction. For example, in the 1967 Star Trek episode, The Doomsday Machine, neutronium formed the hull of a giant, autonomous “planet killer”, and was portrayed as being invulnerable to all manner of scans and weapons. Since free neutrons at standard temperature and pressure undergo β– decay with a half-life of 10 minutes, 11 seconds, a very small quantity of neutronium could be quite hazardous to your health. On 17 January 2019, the University of St. Andrews posted a news article stating that a periodic table of the elements dating from 1885 recently was found at the university and is thought to be the oldest in the world.